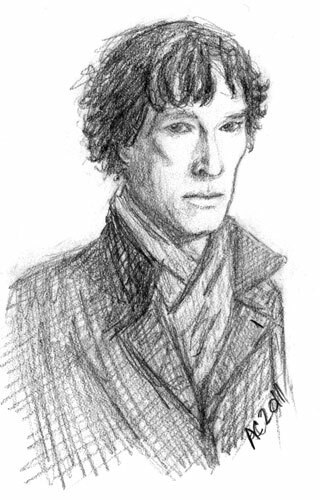 After my first sketch of Sherlock from his new BBC Series, I decided to challenge myself to get the face right (or at least more right, heh) and do a potrait. I can still see that there’s something slightly off here even after erasing every single facial feature at least twice and redrawing it, but after 3 sessions of work on it I’m actually pretty happy with the result. It’s recognizably him, there’s just a few details that aren’t quite perfect. I’ve been thinking that I need to spend time learning how to draw character faces with different expressions, not just the expressions but the faces themselves, as a lot of cartoon-style art involves drawing the same person over and over and making them look consistent, so expect to see more Sherlock and probably his incarnation of Dr John Watson as well. And yes, I’m already working on the weebles. What, like you’re surprised?